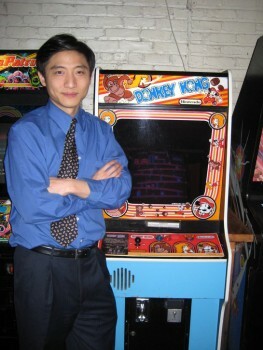 Hank Chien is the new King of Kong, racking up a score of more than one million points to reclaim the world record high score in the classic arcade machine Donkey Kong. I don't really get why people keep banging away on 30-year-old stand-ups, and I say that as someone who spent a lot of time in the arcades of yore when those old machines were the new hotness. It was fun in 1982 but what's the point now? Can't we all just get along? Not if you're one of the Donkey Kong elite, apparently. Hank Chien is the new big dog in the Donkey Kong pack, setting a mark of 1,068,000 points to surpass Steve Wiebe, who beat Billy Mitchell for the title in September 2010 after Mitchell claimed the title in July of that year from none other than Chien - who beat the previous mark set by Mitchell in February. It's definitely a club with a pretty select membership. Chien set the new record in his second attempt of the day, with a time of two hours and 45 minutes. He said he hadn't played much Donkey Kong in the months leading up to the record-setting effort but was motivated to get himself back into game form by the upcoming "Kong Off" being put together by Mitchell and Richie Knucklez, which will be attended by Chien, Mitchell, Wiebe and other top players. "I know it will only be a matter of time before Steve Wiebe, Billy Mitchell or another competitor beats my score," Chien told Twin Galaxies. "I don't think I will hold the title forever, but it is fun to see 'how high can you get?'" Richie Knucklez "Kong Off," a "no excuses, put-up-or-shut-up event," will take place over March 19 and 20. Check out thekongoff.com for details!